2009 co-op shares are sold out already! How excited am I?! I am right now carding wool (from sheep who think oats and straw are some kind of ritual adornment) so I’ll be back later with more news. I’m feeling very bouncy about this. I’m going to go hug a sheep. What that is, that is a llama eating hay at the trough with the sheep! While I am far enough away to take this picture! He seems to be being accepted as a sort of honorary sheep. We, the stupid humans, keep telling them that he’s a LAMB-a, but that’s ridiculous. It’s obvious that he is not a sheep; they think maybe he’s a goat. Blackie, who knows goats, says he isn’t, but she hasn’t been able to come up with a more plausible suggestion. They would ask, but nobody has a clue what he’s saying. If you’ve been reading this blog for that long, which probably you haven’t, you may remember waaaaay back at the beginning when I got hooked on spinning, and I said I was thinking of hanging out in Downtown Buxton (‘downtown Buxton’, hee-hee, that would mean ‘at the barber shop’) with a sign around my neck reading “will work for wool”? Yeah, well that actually turned out pretty well for me, in fact. And then I got these sheep. These darling, personality-packed oh-how-I-love-them sheep. Dating from about a week before the sheep actually moved in, Raven and I had started talking about the concept of a Fibre Co-Op. He’d been hearing/reading about some co-operative crop farms, and things were working pretty well for the people involved in those ventures – so well that one of them was planning to expand into livestock in the following year. (The popular term I believe is CSA – Community Supported Agriculture. I’m ignoring that for the moment, but you can call it whatever makes you happy. We couldn’t see any particular reason why the same idea wouldn’t work for fibre, and so we both got kind of set on the idea. Then Jodi found and sent me a link to the Martha’s Vineyard site, which basically just proved that the time was right for this sort of thing and other people were having the same idea. So we spent a year and a bit learning about being shepherds, we got a new ram and some more pasture, we got a llama. And we still want to do this thing. So we’re doing it. (Really, we’re actually doing it! We have members already! Welcome, people!) There are still shares available through that etsy link up on the right. I am not posting all the shares at once, because I don’t know whether there will be more interest in roving or in yarn, so if you try to buy in and they’re sold out, just email me or comment and I’ll let you know what the actual status is. Since this is the first year, we have dramatically limited the shares. At the moment I am processing all the wool myself – this will probably change in the future, but only if I can find a trustworthy, preferably small-scale and local milling operation. I am already looking at options, but dudes, there is a rant coming. Anyway. In order that everybody get a nice big share of the wooly harvest, and in a timely manner, and in order that we can together improve and hopefully expand the operation, we’re starting small. I’ve set it up so you can purchase either a yarn share or a roving share (or both, who am I to judge?). 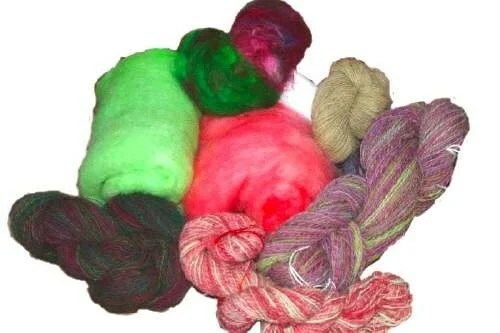 Each annual share equals about five pounds of wool through the year. There are three farms providing wool, so you will get some Blackface, some Rambouillet, some Lincoln and some Llama – although the llama will be just a taste, ‘cos he’s not so big yet and there’s only one of him. But dudes, Virgin Llama – it’s like a first-year bonus package! Some of the wool will be 100% insert-sheep-here, some blended, so you can have a nice sampling of what these wools are like and what you can do with them. I was stymied for a while trying to figure out what to do about colours – didn’t seem fair for me to pick, and anyway lots of people may want to dye their own – but offering all the bazillion options for weights and colors and not was just going to turn into a paperwork nightmare. Then I found Willow Tree Farms, and they are using the smack-yourself-in-the-forehead-it’s-so-obvious solution: before each shipment goes out, everybody gets a colour sheet and they can pick what they like best from a selection of dyed or hand painted (or natural). That way you know and have some more control over what you get. And over time the available colourways will grow, as we get struck by inspiration/aspiration. As far as member participation goes – your money will be used to sustain and improve the flock (i.e. breeding for more yummy wool) and generally allow them to live their happy sheepy lives in whatever way makes them comfortable. In return, you get a bunch of wool. But it doesn’t have to stop there – your comments and questions are welcome and your ideas will be given serious consideration. And of course, if you’re in the area, stop by and have a visit. We won’t make you shovel poop, and you can take Blackie for a walk. She loves that. I spun it (obviously) and then I’d been going to ply it with something dark, á la that purple and blue stuff Emily gave me ages ago, but then I remembered I had quite a lot of blackface dyed with some red wine that had gone off. It came out a strange sort of not-quite-pink, not-quite-gray neutral, and was oddly soothing to me. So I plyed it with that instead, and I quite like it! I also love the texture difference between the rambouillet and blackface singles. Blackface is a fuzzier, bouncier wool, and in contrast with the smooth-but dull R, it looks so earthy! I’m going to wind up with around 500 m DK weight when the other batt is finished, and I’m leaning towards playing around some more with shadow knitting. This particular lump of wool (she says, determinedly doing a really crappy sell-job) is up in my…. da da da! Etsy store. (link on upper right) Yep, finally set it up. Not that there is much in it at the moment, but there it is. Aargh! Ok. In relation to the Etsy store, I just typed in a big intro to the fact that I am starting a fibre co-op, as I have wanted to do since the sheep first moved in. And then my finger did something weird and it all went away. I’m going to have more (clearly needed) coffee now, and then I will come back later and do a post all about the co-op (or CSA if you prefer), which should probably have it’s own post anyway, for reference. Yes. That is better. I meant to do that. Ok, not really a lot of “A” but some. Yes, Llamas make good guard animals. The three options we had for a guard were a donkey, a llama or a dog. Donkeys got crossed off the list right away because Raven and I are both deathly allergic to horses. A dog was top of the list because Raven kept insisting I was mad to get a llama, and a barking dog is good security across the board. But we already have the freest of free-range chickens, and this spring Raven plans to get ducks, so we were going to have to be incredibly picky about breed and spend a lot of time training a dog not to chase the birds. So the llama was looking better, and Raven caved. So yes, llamas are guards, and no, my yard/pasture are no longer a good place to be a puppy. They can learn to get along with dogs they live with, but Bryan, my 16-year old lab, is failing badly. He is already afraid of sheep and chickens, and only goes out in the front of the house (when he actually bothers to get up), so he doesn’t even know there is a llama. Bryan is a wonderful dog, we were incredibly lucky to have him, and his failing condition is another part of the reason we don’t want to start with another dog right now. Another perk with llamas for me is of course that they have fleece. Galahad is all soft and cushy, and all of his colour is in his guard hair, the undercoat is white like the snow. His guard hair is pretty soft too, and it may or may not stay that way. A lot of llamas in North America have been bred for softer hair because of crazy fibre junkies like you and I, but since Galahad is only a baby his hair may thicken up, I really don’t know. Looks like his ‘virgin’ fleece is going to be a dandy, though! And no, the postman hasn’t met him yet. He (Galahad, not the postman) has his own stall in the sheep barn, so that he has a safe place where the sheep won’t beat him up. We bring him out several times a day, since we’re having a warm spell right now, to let him run around and get used to the yard and the sheep, and the sheep push him around, and when he or we get sick of it he goes back to his stall. He likes the sheep, he really wants to hang out with them, they just all have to get their highrarchy sorted out. That took maybe two weeks when Vellum came in and now they’re fine – probably take a bit longer with Galahad because of the stall and the supervised play, but he’s several months younger than Vellum and has no mommy to hide behind when things get rough, so I’m not ready to just throw them all in together and walk away! Llamas are very trainable, Galahad is already fine with putting on a halter, and we started working on “stand still” this morning. (That will be needed for combing and shearing later). I also have to work on his allowing me to touch areas he doesn’t like, such as his legs and feet, so that I will be able to trim his hooves when needed. He loves neck rubs, so I have a starting point for that. There is lots and lots of llama info online, so if you want any more detail, it is out there. I’m still researching too, mostly now things that I can train Galahad to do that he might enjoy. I don’t particularly need a ‘trick llama’, but they are very intelligent, and because he’s bottle-fed and basically sees me as ‘mommy’ (I know, that was fast, huh?) I want to make a lot of my time with him ‘teaching time’ so when he gets older he doesn’t mistake me for having a place in the flock somewhere. That is when they will spit and kick, it’s a pecking order thing. The postman is gonna love this. The postman likes my sheep. We have the only sheep on his route, so he might just like sheep, but also Freyja tends to peer over the wall and ‘baa’ at him – maybe she is expecting some mail? – so I can tell when the mail has arrived by the loud laughter and shouts of “baa, baa!” coming up my driveway. So I can only imagine his reaction when he meets the latest addition. Galahad is a three-month old llama. His mother had him and left him lying in the sun to dry off, which is perfectly proper behavior for a mommy llama, except that it happened to be a cold rainy day in November, and he was in danger of freezing to death instead. She wasn’t a llama who liked people at all, and wouldn’t bring him in (or let herself be brought in) to shelter, so his person just grabbed him and brought him in herself. He has been bottle-fed, but he’s been in a barn with some goats, a sheep and an alpaca friend, so he hasn’t been lonely, and the alpaca (who is actually half-llama himself) is a bit older, and has been able to teach Galahad important things like “what corn is for” and “why wooly people are better”. My sheep, although the situation was explained to them in detail yesterday, are still a bit unsure how to react. He even tried a bit of leafy hay. That stuff is actually pretty good! So, um, yeah. We have a llama. When he gets older, he will have a job: He’s going to guard the sheep. Also he is wonderfully soft and fluffy and gives kisses if he likes you. Sorry, no pictures today. This is just another ramble about the hand/brain thing. I have been spinning that batt I dyed, and there is also knitting. I will have pictures next time. Today is just another musing… is it strange, what is happening to me, or only strange that I even notice? Because, I think my left hand is plotting something. I am right-handed. Very. I have always been verbal, analytical, and extremely competent with my right hand, while my left has been the stupid sibling. Sweet enough, willing to put in the effort, but just kind of slow. And clumsy. Pretty much incompetent, in fact. When I was younger I used to try to make it better at things – teach it to write, for example, but it just couldn’t catch on, and the right hand and the brain figured out pretty early that holding things in place and keeping out of the way were about the only jobs the left hand could manage without disaster. Over the last while, I’ve known that my ‘right brain’ was taking a bit more of an active part in things. I’ve developed my visual senses more, sometimes at the cost of vocabulary, but I’m not minding that. I’m not writing, but I am drawing and designing and having a great time with all that. Last summer, on a family trip to Virginia, I knitted dishcloths. All the way there and back, I made dishcloths. At one point, to break up the monotony, I tried to teach my left hand to carry the yarn. It was like learning to knit all over again, wonky tension, utter confusion over where exactly the yarn was supposed to go, how I should hold it… I did manage several rows, lopsided and ugly though they were – enough to persuade me that if I was doing colour stranding and if I was very careful, I could probably stumble through it, but it was slow and frustrating. Then last week I started these mittens, which are two-colour multiple chart mitts. Enter the left hand. It was doing fine! It is fast, even, no stumbling, and it can even wrap the yarn around its own fingers without help. Out of curiosity, I decided to knit this shrug with the left hand as well. It is going swimmingly. In fact, the left hand is now petitioning that I should learn to knit properly (actually I knit kind of backwards, which isn’t a problem when I’m doing it with the right hand, but it makes purling nigh impossible with the left) so that it can purl too. I’ve also noticed that sometimes the left hand is reaching for things now – and not dropping them! Not all the time, but frankly it has never shown this much initiative. And the foot is getting in on it too – I’ve been leading with my left foot when spinning. And my final clue that something is up? I’ve been pulling to the left when backing into my driveway. I mean, way to the left, I’ve managed to get the truck stuck in a snowbank twice in the last week. This is because I usually drift to the right, and so I am used to compensating for that – but now I am overcompensating. I’m thinking maybe soon I will let my left hand try to draw a picture and see how it does. I’m not sure what I’ll do/feel if it is actually successful!